Voters in 36 states will choose governors this year. Less than three months out from the first major election since the inauguration of President Donald Trump, much of the national focus remains on high-profile U.S. Senate and House races that could determine control of Congress. But while millions of dollars pour into those important congressional races, voters in 36 states will choose governors this year, including 26 currently under Republican control. That has Democrats hoping for a resurgence on the state level in places where they’ve been pushed out of power. The wide range of gubernatorial contests has seen Democrats looking to expand the map into red states where they have not been competitive for years. At the same time, Republicans are looking for unique opportunities to pick up seats in states that may tilt blue in presidential years but trend purple in off-year and statewide races. Following the 2008 elections, the Democratic Party held 32 governorships. In the aftermath of the Republican wave election of 2010, the balance of power in governorships was flipped, and the GOP took control of 32 seats nationwide, a dramatic shift that has endured for the rest of the decade. Republicans have total control of half of the state legislatures across the country and make up 56 percent of state legislators, according to the National Conference of State Legislatures (NCSL). Democrats are eyeing an end to the GOP dominance on the state level this cycle, a road that runs through states like Wisconsin, where the party views Gov. Scott Walker, who is running for a third full term, as particularly vulnerable. "In Wisconsin, Scott Walker is right. He is in deep, deep trouble. It is very difficult to see how he survives," Democratic Governors Association Chairman Gov. Jay Inslee of Washington State told ABC News. 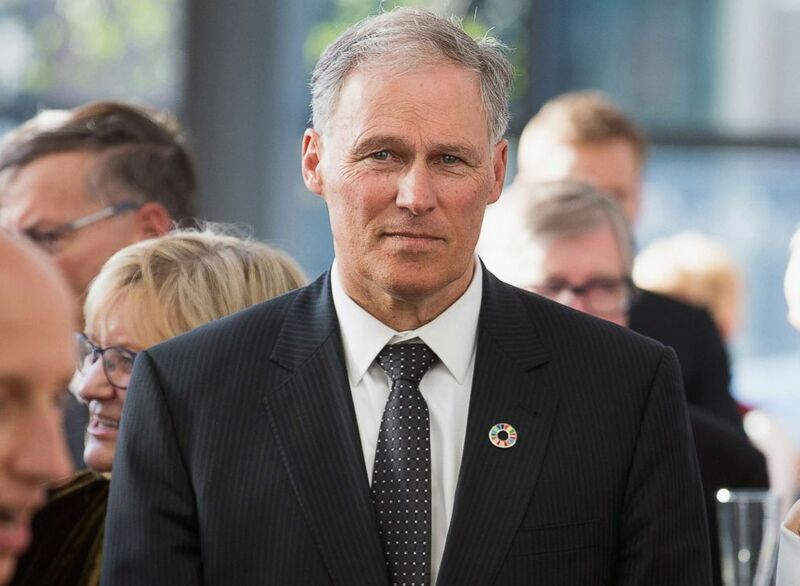 (Mat Hayward/Getty Images, FILE) Washington Governor Jay Inslee attends a reception, May 4, 2018 in Seattle. A recent NBC News/Marist poll showed Walker trailing Wisconsin Superintendent of Public Instruction Tony Evers, one of eight Democrats competing in Tuesday’s primary to take on Walker in November, by 13 points. Other Democratic contenders in the crowded and complicated primary include former state lawmaker Kelda Roys, the African-American leader of a state firefighter union Mahlon Mitchell, former state Democratic Party chair Matt Flynn, Madison Mayor Paul Soglin and state lawmaker Kathleen Vineout. Whoever emerges from the crowd Tuesday has a tall task in unseating Walker, who alongside the state GOP has built a powerful infrastructure in the state that has allowed him to win two full terms and survive a recall election in 2012. That a state like Wisconsin, which has trended red in recent cycles and in 2016 sided with the Republican nominee for president for the first time since 1984, is in play for Democrats this year shows the breadth of the opportunity they see for pickups on the state level. Democrats view the Midwest as a particularly fertile ground to pick up governorships this cycle. In addition to Wisconsin, the open seat races in Michigan and Iowa are possible pickup opportunities. In Illinois, GOP Gov. 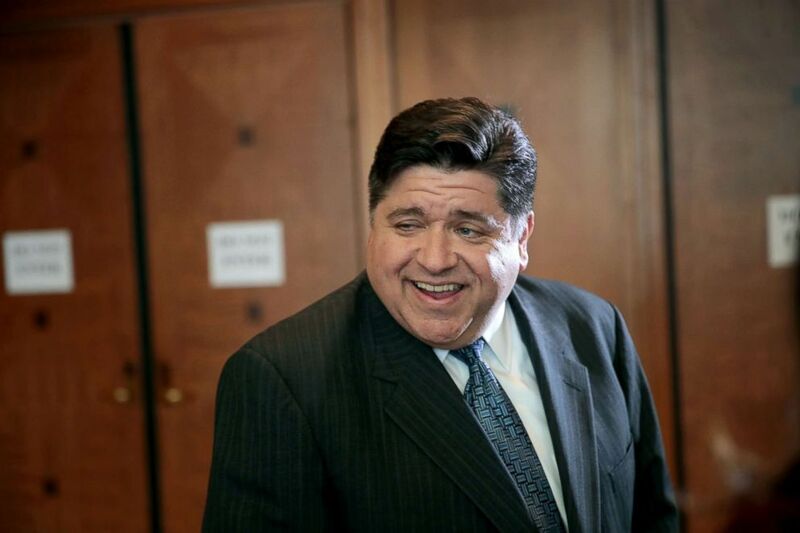 Bruce Rauner is viewed as the most vulnerable Republican in the country, and Democrats are hoping that the deep pockets of Hyatt hotel chain heir J.B. Pritzker will help them take back control of the governor’s mansion. (Scott Olson/Getty Images) Illinois gubernatorial candidate J.B. Pritzker attends the Idas Legacy fundraiser luncheon, April 12, 2018, in Chicago. There are 15 governorships currently held by Republicans that the University of Virginia (UVA) Center for Politics rates as either "Lean Republican" or "Toss-up," giving Democrats a vital opportunity to rebuild their strength at the state level. "This year’s midterm is absolutely critical to regaining Democrat strength in governorships and also state legislative seats, where Democrats lost well over 900 during Obama’s two terms as president," Larry Sabato, director of the UVA Center for Politics, told ABC News. "Redistricting is coming up in 2021-22, and most of the people elected this year will be in office then. Democrats got skunked in 2011-2012 in redrawing the lines, and they can’t afford to let that happen again." "With 26 GOP governorships on the chopping block and only 9 Democratic ones, this is the exact mirror of the Senate elections," Sabato added. "Just as Democrats are disadvantaged in the Senate by having to defend so much territory, so too are Republicans in the governorships." Other key pickup opportunities for Democrats include blue states like Maine and New Mexico, where term-limited GOP governors are likely to give way to well-funded and established Democratic candidates. In Maine, Democrats nominated state Attorney General Janet Mills, who has the chance to be the first female governor in its history, and in New Mexico Rep. Michelle Lujan Grisham is looking to succeed GOP Gov. Susana Martinez. Democrats are also hoping to compete in redder states where a favorable national political environment could help push compelling candidates over the top. States like Georgia, where Stacey Abrams is aiming to become the nation’s first female African-American governor, Kansas, where a bitter GOP primary may drag on for weeks in a recount, and South Dakota, where state lawmaker Billie Sutton is running as a "prairie populist," hoping to appeal to the state’s overwhelmingly conservative electorate. But despite the Democratic optimism, there are still states where Republicans see opportunities to go on offense. Democrats' strategy of exploiting Trump's unpopularity to energize voters might be creating gains in some red states, but in historically blue states, a changing of the guard might be coming. Connecticut and Minnesota voters are less than 24 hours away from shaping the ballot for the next chief executive, and with the specter of a blue wave looming over the GOP across the country, Democrats in these states are contending with a similar, deeply troubling reality: Republicans taking back the governorship. The Nutmeg State has not supported a Republican nominee for president since 1988 and Democrats hold a tight grip on federal offices: Both Sens. Chris Murphy and Richard Blumenthal and all five congressional representatives are Democrats. In the Land of Ten Thousand Lakes, the GOP has not won a statewide election in over a decade, both U.S. Senators are Democrats, and Democratic House members outnumber their Republican counterparts 5-3. But there is growing optimism for the Republican Party at the state level, where Connecticut’s state Senate is evenly tied and Democrats are defending a slim 9-seat majority in the state House, and the GOP controls both chambers of Minnesota's state legislature. It wasn’t that long ago that the top office in either of these states was held by a Republican -- former Gov. Jodi Rell in Connecticut who preceded Malloy before he was elected in 2010, and former Minnesota governor and now-candidate Tim Pawlenty in 2011. In a state in which among registered voters, Democrats outnumber Republicans by about 5 to 3, Connecticut is shifting from a deep blue towards purple in the Trump era, and in a strong signal of the state’s dissatisfaction with a stagnant economy and Democratic Gov. Dannel Malloy -- who is not seeking re-election -- the race for the state’s top office is a toss-up. Five Republican contenders are seizing on the opening to succeed Malloy: Bob Stefanowski, Stephen Obsitnik and David Stemerman are all political outsiders coming from the upper echelons of the private sector; and Danbury Mayor Mark Boughton, the GOP-endorsed candidate, and former Trumbull First Selectman Tim Herbst, are tethering their candidacies to their experience in local politics. The GOP primary echoes a reappearing theme this cycle, one that is splitting the party in races with a crowded field: voters must choose between establishment, politically experienced candidates and Washington outsiders that bring a 2016 Trump-like style to the trail. Tapping into the more rural, blue-collar parts of the state that better reflect Trump country than the Golden Coast, the Republicans have focused on blaming Malloy for the current state of the economy and promising a comeback for Connecticut by embracing the president’s agenda. On the Democratic side, Bridgeport Mayor Joe Ganim is challenging Greenwich-based cable television executive, Ned Lamont, who secured the party’s endorsement in May. Ganim is no stranger to underdog status -- he made a stunning return to Connecticut politics in 2015 when he was elected to a sixth term as mayor after serving seven years in prison for corruption. 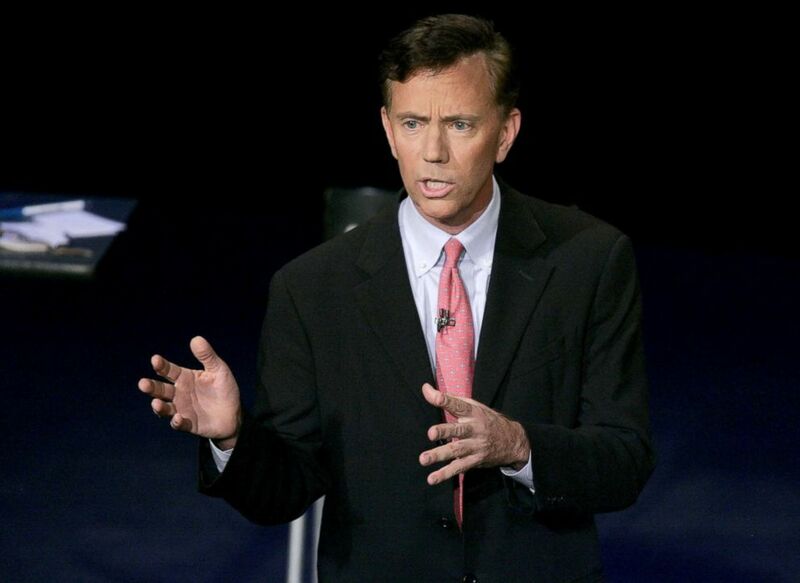 (Bob Falcetti/Getty Images) Ned Lamont speaks to challenge senator Joe Lieberman during a debate at the Garde Arts Center, Oct. 23, 2006, in New London, Connecticut. Making the case for his candidacy, Ganim said in a statement to ABC News, "It is important for Democrats to pick a candidate to run for governor who connects with ordinary working people in the state of Connecticut and I am that candidate." But Lamont is confident that he will be successful as the outsider candidate Tuesday. "I think we're in a pretty strong position but I have to earn it every second," Lamont told ABC News. "We're gonna come in as an outsider, a problem-solver who makes the changes to get Connecticut moving again." Yet some political experts are wary about the Democrats' grip on the state. "You wouldn’t expect Connecticut to vote for a Republican," said Geoffrey Skelley at the University of Virginia Center for Politics. "However, Malloy is really unpopular." Halfway across the country, in another staunchly blue state, is a toss-up race and possible Democratic anomaly in 2018. Minnesota’s gubernatorial contest to succeed sitting Democratic Gov. Mark Dayton is turning into an opportunity for Republicans to capture the governorship. Leading that effort is presumptive front-runner Pawlenty. After serving two terms as governor from 2003-2011 and launching a comeback bid for his old job, the former governor and presidential candidate is using name recognition and a deep chest of fundraising cash to fuel Republican energy. Pawlenty, who skipped the Republican convention, is also hinging his hopes on the Trump factor. Hillary Clinton won the state narrowly in 2016, by less than 2 percentage points. Pawlenty faced a few stumbles early on, including losing the party’s endorsement to Jeff Johnson, the 2014 Republican nominee. But he is still favored in Tuesday’s primary, according to the NBC News/Marist poll, which puts him in the lead by 15 points. (Getty Images) Former Minnesota Governor and Republican candidate for president Tim Pawlenty speaks at the Cato Institute in Washington, DC, May 25, 2011. A lot is at stake for Democrats to stem a "red wave" in this liberal stronghold, as the next governor will be involved in redrawing Minnesota’s congressional map for the next decade after the 2020 census, possibly reshaping the balance of power in Congress. The Democratic field is a tight three-way fight between Rep. Erin Murphy, who clinched the party’s endorsement, Rep. Tim Walz and the more moderate Attorney General Lori Swanson. According to the NBC News/Marist poll, the top two contenders are neck-in-neck: Swanson captures 28 percent support from registered voters, compared to Walz’s 27 percent. State Rep. Erin Murphy trails with only 13 percent of voters. 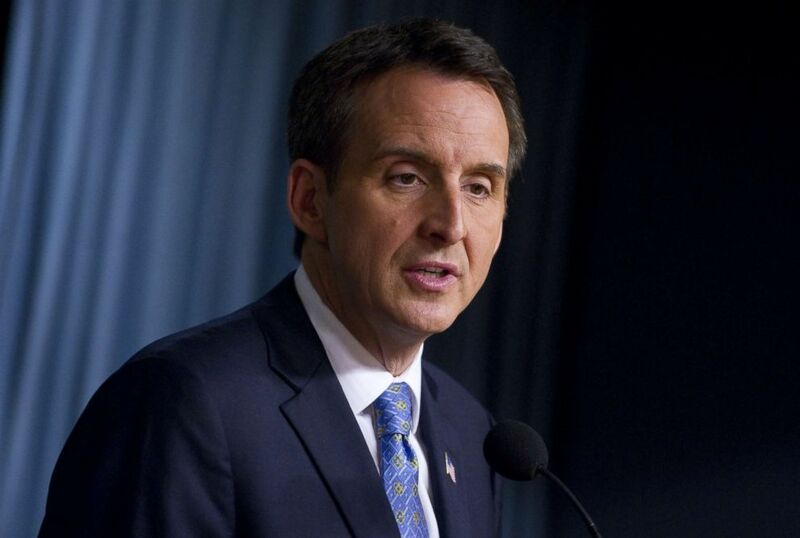 With a strong candidate at the top of the ticket in what is expected to be a competitive general election race, Minnesota Republicans may have a fighting chance to propel Pawlenty to the governor’s mansion. Victories are looking more and more possible for Republicans, who are targeting governorships in Alaska, Minnesota, and Connecticut, according to Sabato. "Realistically, that’s their playing field," he said. Connecticut and Minnesota are in the GOP’s crosshairs, and these deep blue states represent outliers for Democrats this cycle. But voters will ultimately decide who lands on the general ballot, and usher in a fierce yet uncertain November.